For the Vermont college, see Marlboro College. For the former college in Blenheim, New Zealand, see Marlborough Boys' College. Marlborough College is an independent boarding and day school in Marlborough, Wiltshire, England. Founded in 1843 for the sons of Church of England clergy, it is now co-educational. For the academic year 2015/16, Marlborough charged £9,610 per term for day pupils, making it the most expensive day school in the Headmasters' and Headmistresses' Conference (HMC) – the association of British independent schools. Fees for full boarders are up to £12,175 per term, the 28th most expensive HMC boarding school. The Good Schools Guide described Marlborough as a "famous, designer label, co-ed boarding school still riding high." The school is a member of the G20 Schools Group. A sister school in Johore, Malaysia opened in 2012. Founded in 1843 for the education of the sons of Church of England clergy, the school now accepts both boys and girls of all beliefs. Currently there are just over 900 pupils, approximately 45% of whom are female. New pupils are admitted at the ages of 13+ ("Shell entry") and 16 (Lower Sixth). 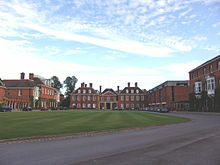 Marlborough was, in 1968, the first major British independent school to allow girls into the sixth form, setting a trend that many other schools followed subsequently. The school became fully co-educational in 1989. The school has also been pioneering in other fields, making a major contribution to the School Mathematics Project (from 1961) and initiating the teaching of Business Studies at A level (from 1968). The traditional British boarding school system, known as fagging, where junior pupils became personal servants to the senior boys was officially abolished in the 1920s, and Marlborough was one of the first public schools to do so. However, unofficial fagging did persist beyond this change for some time. In 1963 a group of boys, led by the future political biographer Ben Pimlott, wrote a book, Marlborough, an open examination written by the boys, describing life at the school. The writer and television critic T.C. Worsley wrote about predatory masters at the school in his critically acclaimed autobiography Flannelled Fool: A Slice of a Life in the Thirties. In 2005 the school was one of fifty of the country's leading independent schools which were found guilty of running an illegal price-fixing cartel, exposed by The Times, which had allowed them to drive up fees for thousands of parents. Each school was required to pay a nominal penalty of £10,000 and all agreed to make ex-gratia payments totalling three million pounds into a trust designed to benefit pupils who attended the schools during the period in respect of which fee information was shared. However, Mrs Jean Scott, the head of the Independent Schools Council, said that independent schools had always been exempt from anti-cartel rules applied to business, were following a long-established procedure in sharing the information with each other, and were unaware of the change to the law (on which they had not been consulted). She wrote to John Vickers, the OFT director-general, saying, "They are not a group of businessmen meeting behind closed doors to fix the price of their products to the disadvantage of the consumer. They are schools that have quite openly continued to follow a long-established practice because they were unaware that the law had changed." The college is built beside the Mound. This was used as the motte of a castle. No remains of the castle can be seen today. Radiocarbon dating of core samples in the early 2010s indicated that the Mound dates from 2400 BC. This is close to the dates established for Silbury Hill. The main focus of the college is the Court. This is surrounded by buildings in a number of different styles. At the south end is the back of an early 18th-century mansion, later converted to a coaching inn which was bought as the first building for the school. Next to it are the old stables, now converted into boarding houses. The west side consists of the 1959 red brick dining hall, and a Victorian boarding house now converted to other purposes. The north west corner is dominated by its Victorian Gothic style chapel by the architects George Frederick Bodley and Thomas Garner which has an interesting collection of pre-Raphaelite style paintings by John Roddam Spencer Stanhope and stained glass by William Morris. The rest of the Court is surrounded by buildings in styles ranging from the "Jacobethan" (a name coined by John Betjeman, an Old Marlburian) to classical Georgian and Victorian prison. The latter, B house (now just called B1), was (along with the College Chapel) designed by the Victorian architect Edward Blore, whose other works include the facade of Buckingham Palace (since redesigned) and the Vorontsovsky Palace in Alupka, Ukraine. On the other side of the Mound is the Science laboratory, built in 1933. It is an early example of shuttered concrete construction and was listed as a building of architectural significance in 1970. Pupils are assigned to one of the Houses on entering the school. This is where they live and make their home while at school. The Houses compete against one another in sports. The Houses are divided into In-College Houses which are mostly gathered around the central Court and Out-College Houses which are located around the western side of the town. Unusually, the older In-College Houses were not historically given names but were referred to by an alphanumeric title. A reorganisation a few years ago combined some houses and eliminated some of the older numbered Houses. More recently created Houses have been given names either reflecting their location or commemorating a figure from the school's past. Until 1967, when Turner House and Summerfield became the first all-age houses, all boys entering the school first joined a junior house for three or four terms. There were five out-college junior houses – Priory and Upcot which were both closed in 1967, Barton Hill which became an all-age in-college house in 1974, Hermitage which had closed in 1911 but reopened 1974–77, and Elmhurst which was closed in 1988 and reopened as a girls' house the following year. There were two in-college junior houses (A1 and A2) which shared A house; these were closed in 1989 and reopened as a girls' house renamed Morris House. At the same time the other senior houses began to take in boys directly from prep schools – Preshute (1970), Cotton (1976), Littlefield (1977) and the in-college houses in 1989. B2 (which had shared B house with B1) and B3 ceased taking in new boys in 1989 and were both closed in 1992. When the College became fully co-educational in 1989, three girls' houses were opened – Morris, Elmhurst and Mill Mead; New Court was opened in 1991. Morris was moved in 1995 from A house to Field House, which had previously been occupied by B3 and C2. New houses were built to accommodate C3, which had previously shared C house with C1 (in 1989) and C2 (in 1992). In 2012, the College acquired the Ivy House Hotel in Marlborough High Street which opened as a girls' house in the autumn of 2012. In 1933, the school lent its name to one of the steam locomotives in the Southern Railway's Schools class, which were named after English public schools. The locomotive bearing the school's name (no. 922, later 30922) was withdrawn in 1961. Both its nameplates are now on display at the school – one in the Norwood Hall and the other in the science labs. "Marlborough College". Caricature of George Charles Bell by Spy published in Vanity Fair in 1902. See List of notable Old Marlburians for details of former pupils. Societies for former pupils include The Marlburian Club and the Old Marlburian Lodge (of Freemasons). The Summer Term, from late April to late June or early July. The Memorial Hall was built to commemorate the 749 Old Marlburians who were killed in World War I. Following World War II, the names of those killed in that war were added to a memorial panel in the entrance hall. The hall is a semi-circular auditorium of stepped seats. There is a stage at the front. Below the seats with access from the outside rear are a number of music practice rooms. The façade of the hall towards the forecourt and road has two entrance lobbies linked together by eight stone columns. The forecourt is paved with stone. The Hall holds about 800 people so can no longer be used for assemblies of the entire school. It is now most often used for concerts and theatrical productions where the whole school is not expected to attend. The current Chapel is the second to be built at the school. The first was opened in 1848 but by 1880 the school numbers had outgrown its space. After consideration of expanding the existing building, it was demolished in 1884 and a new Chapel was designed and built. The new Chapel, designed in the Late Decorated Gothic style, was dedicated to St Michael and All Angels and was consecrated in 1886. The original colour scheme of greens and browns was much loved by Sir John Betjeman and there are twelve large Pre-Raphaelite murals by Spencer Stanhope which depict various Biblical scenes involving angels. Those on the north side show scenes from the Old Testament while the six on the south side are from the New Testament. Two other artistic features are the Scholars' Window on the south side, which was designed by Edward Burne-Jones and made by Old Marlburian William Morris, and a sculpture of "The Virgin and Child" by Eric Gill near the west door. In 2010, the Chapel was closed owing to structural defects. After being repaired, it was declared safe to use. The department has recently created an onsite design library with dedicated seating to encourage student use. All music halls and performance areas are fitted with soundproof windows which prevent sound from escaping, even while open, as well as walls engineered to prevent sound crossing at right angles. The floors of the centres also float on a bed of air, so as to maintain good soundproofing. The Blackett Observatory houses a 10-inch-aperture Cooke refractor on a motorised equatorial mount. The telescope dates from 1860 and was used professionally at the Radcliffe Observatory at Oxford University. When the Observatory was relocated to South Africa in the 1930s, Sir Basil Blackett, a president of the Marlburian Club, raised the funds to purchase it and have the observatory built on the playing fields of the college. In 1997 a restoration effort was started which was finished in 2002 when the telescope was reopened for use. It is currently used to teach astronomy and is also open to local astronomers from outside the college. A fully operational army-only CCF detachment operates at the college under the supervision of a resident SSI (school staff instructor). Weekly parades take place at the parade ground adjacent to the armoury, with occasional off-campus activities, such as range-days or overnight exercises. Next to the CCF parade ground is a six-lane .22 rifle range. Rifle shooting has had a long history at the college, with teams representing the school since 1862. ^ a b "School Termly fees (£) : Marlborough College - £9,610" (PDF). Privateschoolfees.co.uk. Retrieved 10 September 2017. ^ "Marlborough College, Marlborough – The Good School Guide". Goodschoolsguide.co.uk. Archived from the original on 10 April 2011. Retrieved 16 November 2010. ^ "Marlborough opens international school in Malaysia". BBC News. 25 August 2012. ^ Boehm, Klaus; Lees-Spalding, Jenny. "Marlborough". Guide to Independent Schools. Archived from the original on 16 July 2012. Retrieved 16 September 2012. ^ Worsley, T. C. (1967). Flannelled Fool: A Slice of a Life in the Thirties. London: Alan Ross. ^ Halpin, Tony (10 November 2005). "Independent schools face huge fines over cartel to fix fees". The Times. London. Retrieved 12 May 2010. ^ "Private schools send papers to fee-fixing inquiry". The Daily Telegraph. London. 3 January 2004. Retrieved 15 March 2011. ^ Leary, Jim; Marshall, Peter (December 2012). "The Giants of Wessex: the chronology of the three largest mounds in Wiltshire, UK". Antiquity Journal Vol. 86, Issue 334. Retrieved 12 August 2016. ^ "Listing of the Science Block by English Heritage". Heritagegateway.org.uk. 28 January 1971. Retrieved 16 November 2010. ^ Bradley, D.L. (October 1975). Locomotives of the Southern Railway: Part 1. London: RCTS. pp. 26, 27, 41. ISBN 0-901115-30-4. ^ Mills, Richard (18 May 2017). "First woman appointed as Marlborough College master". The Wiltshire Gazette and Herald. Retrieved 13 September 2018. ^ Official website Archived 11 August 2011 at the Wayback Machine of Old Boys' Club. ^ Official website of Old Boys' Lodge. ^ "Notice of closure of the Chapel". Marlborough College. 1 December 2008. Archived from the original on 19 July 2011. Retrieved 16 November 2010. ^ "CCF". Marlborough College. Retrieved 30 May 2017. ^ "Shooting". Marlborough College. Retrieved 30 May 2017. ^ Bradley, Arthur Granville; Champneys, Arthur Charles; Baines, John Ward (1893). History of Marlborough College During Fifty Years, from Its Foundation to the Present Time. J. Murray. p. 302.